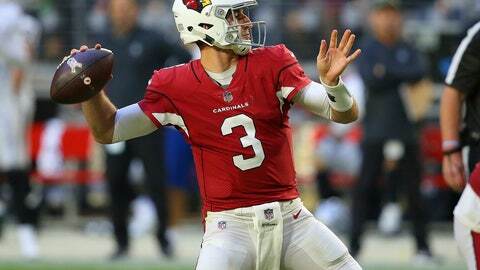 TEMPE, Ariz. (AP) — When Arizona plays at the Los Angeles Chargers on Sunday, rookie Josh Rosen will make his eighth start at quarterback for the Cardinals. It’s been a bumpy, up-and-down ride so far. Arizona is 2-5 with Rosen the starter. “I don’t think that’s good by anyone’s standard,” the 21-year-old quarterback said. Rosen’s statistics aren’t impressive. He’s completed 55 percent of his passes for 1,416 yards and nine touchdowns, with 10 interceptions. In his last six games, he’s thrown for seven TDs and was intercepted eight times. In Arizona’s 23-21 home loss to Oakland last Sunday, Rosen threw for a career-best three touchdowns but was intercepted twice. Both interceptions led to Raiders touchdowns. Rosen completed only nine of 20 passes in the game for 136 yards, 59 of them on one play. Rosen, by nature, is an aggressive player and he acknowledges having to mitigate that with the willingness to check down and play things safe. Rookie wide receiver Christian Kirk said people need to realize how much Rosen is being asked to do. Seven games into the season, the Cardinals fired offensive coordinator Mike McCoy and replaced him with quarterbacks coach Byron Leftwich. It’s the fifth offensive coordinator in four seasons for Rosen, going back to his early days at UCLA. Rosen praises what Leftwich has done for him. GONZALEZ IS BACK: Zane Gonzalez, the former All-American kicker at Arizona State who played just a little over one season with the Cleveland Browns, is back in Arizona on the Cardinals practice squad. He’s seen as insurance for Phil Dawson, who has had some injury problems, as well as perhaps a kicker for the future for the Cardinals. Gonzalez is just glad to get the chance after being cut by the Browns two months ago. He said he’s finally recovered from a recurring groin injury and didn’t want to talk about his Cleveland experience on Wednesday.